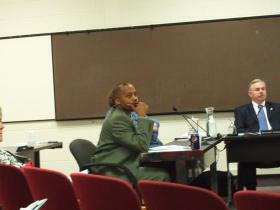 Ypsilanti Superintendent Dedrick Martin will be earning $140,000 a year in his new position, approved by the school board Monday night. Sep. 15, 2009 · 8:44 a.m.
Today marks the beginning of Dedrick Martin’s tenure as superintendent of Ypsilanti Public Schools. His contract was approved by the board of education last night, by a vote of 6-1. Martin, a Muskegon native, previously served as the director of equity and achievement for the Champaign, Ill. unit four school district. Prior to that, he taught and served in administrative roles in Missouri City, Texas. After being seated at the board table, Martin told members of the audience that with community support “we’re going to go on and do some great things. Martin said that there was no single thing he’d like to start working on right away. Instead, he said there were several items he felt he needed to tackle. “Number one on my list is student achievement,” said Martin, adding that district financial issues, stabilizing and increasing enrollment and labor contract negotiations were also foremost on his mind. Martin will receive a base salary of $140,000 per year. He will also receive a $300 monthly car allowance, $75 per month for a cellular phone and $1,500 will be placed in a 403(b) account after every year of service. If he completes his doctorate, he will receive another $2,500 per year. Susan Bloom, a teacher with YPS, was concerned about the standard being set if Martin was offered $2,500 to finish his doctorate and it wasn’t offered to other staff members. “It costs us the same amount of money that it costs a superintendent,” Bloom said. Fanta, the lone ‘no’ vote to Martin’s contract, expressed concern about some of the language of the contract, asking that the board not guarantee Martin up to $3,200 in temporary housing expenses and $1,500 in reimbursement for membership in professional organizations. “It’s not personal, it’s business,” Fanta said, noting some of the financial issues the district faces. The board received the finalized contract shortly before the meeting and took a ten minute recess to go over the contract before voting on it. After the break and discussions among board members, President David Bates indicated that the contract could not be changed in good faith. “So we’re faced with a fait accompli?” Fanta asked. “I think that would be an accurate statement,” Bates replied. Martin replaces Dr. James Hawkins, who has served as Ypsilanti superintendent since 2005, following the departure of David Zuhlke.